This photograph shows the beautiful decoration of the keywell of the Franco-Flemish harpsichord. The nameboard of the instrument has never been widened and so much date to the last ravalement by Nicolas Hoffmann and Jacques Barberini in 1786. The quality of the decoration of the nameboard is very high and is certainly not a later pastiche. This means that this is just about the only decoration on the instrument from this time of the second ravalement in 1786. Just visible are the decorations on the insides of the keywell which are in a totally different style from any of the paintings on the rest of the instrument carried out in the historical period. These are competently carried out on the one hand, but they do not even take into account the eventual presence of the keyboards and keyblocks/ They could not, for this reason alone, have been painted in the eighteenth century since any experienced eighteenth-century decorator would have known that they would have to paint only in the area not obscured by the keyblocks. 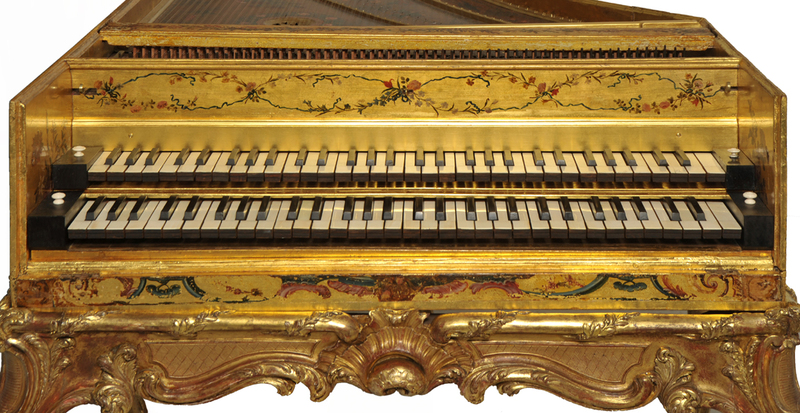 The white keyboard with naturals of ivory and with ebony sharps is unusual for a French harpsichord of this period. Usually a French harpsichord would have had ebony-covered naturals and black-stained pear with bone-topped sharps. However, Jacques Barberini, whose calling card was found on the top of the baseboard when the instrument was opened in 1970, is known to have dealt in English harpsichords and pianos around the time of the 1786 ravalement. The use of ivory naturals and ebony sharps in this instrument may therefore be explained because this was the normal custom in English keyboard instruments of the time, and Barberini chose to follow this tradition rather than the usual French custom of the time. In the old photograph of the instrument, dating from the 1927 sale catalogue by Sotheby's, there was an inscription on the nameboard which then read 'IOANNES RUCKERS ME FECIT ANTVERPIÆ'. This seems to have been removed and replaced by Roberto de Regina in the 1970 'restoration' with a black plastic-coated batten that was inlaid into the nameboard itself. In order to make the keyboards removable from the instrument, the whole of the nameboard was left free to slide up an down, in the style common in many Italian instruments but, of course, completely foreign to the French tradition. In the present restoration, it would have been possible to replace the de Regina namebatten with another fake 'IOANNES RUCKERS ME FECIT ANTVERPIÆ' signature since this is, after all, what the instrument would have had in 1786 when it left the workshop of Nicolas Hoffman. This batten with the Ruckers signature was replaced by a black plastic-veneered batten when the instrument came into my workshops. Should the fake Ruckers namebatten be re-created for the current restoration?? This clearly would add yet another layer of confusion to the story of the instrument, so it was opted to replace the de Regina namebatten with a modern plain gilt batten with my signature on the back. In the light of all of the research and investigation that has been carried out on this instrument which shows that it is not by Ioannes Ruckers, it would also now seem to be perverse to put back a fake signature on an instrument that is clearly not what it is purporting to be. Whatever is done with the batten it seems it would not possible to leave it in the state that the instrument had in in 1786! 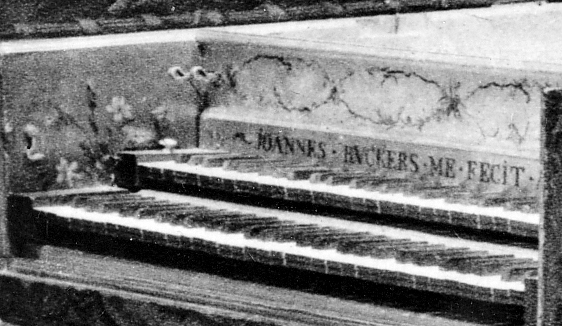 The photograph above, probably taken in 1927, shows a detail of the keywell with the fake signature of Ioannes Ruckers on a namebatten that was subsequently lost or destroyed. The heavy wire-bar stop levers seen in this photograph also did not survive to modern times. The nameboard appears to be glued into the case as is normal here, and was not loose and removable as it was after the 1970 'restoration' by Roberto de Regina in Buenos Aires. The decoration of the bass side of the keywell, partly obscured by the keyblocks, has survived intact to the present and can be seen to the left of the photograph. Although the Tomasini decoration of the keywell sides is vaguely in the eighteenth-century style, the decorator who painted it was so naïve as to paint the whole of the keywell cheeks without taking into account that part of his decoration would be hidden behind the keyblocks when the keyboards were then placed in the instrument. The decoration of the cheeks of the keywell is, however, normal practice and this part of the instrument was usually decorated in the historical period. Even though this particular decoration is not in the historical style it has been decided to leave it as evidence of the 1889 decorator who worked for Louis Tomasini in Paris. A part of the original vernis martin decoration can be seen in the foreground on the lower part of the front edge of the case in the large colour photograph at the top of this page. The continuation of this is painted on the front flap and is visible when the front flap is in place with the keywell closed. It is notable that, already in 1927, the varnish on the outer case decoration was starting to discolour. The nameboard and keywell cheek decorations seen in both of the above photographs show no signs of ever having been cleaned or restored in any way. As can be seen here, the keywell decorations are in a good condition and are, thankfully, not discoloured with the thick layer of linseed-oil varnish which was used elsewhere on the instrument. There is therefore no reason either to clean it, nor to remove it, nor to restore it.